First of all, JOYOUS NEW YEAR!!! PerHAPS this year some bad things will HAPpen to you. 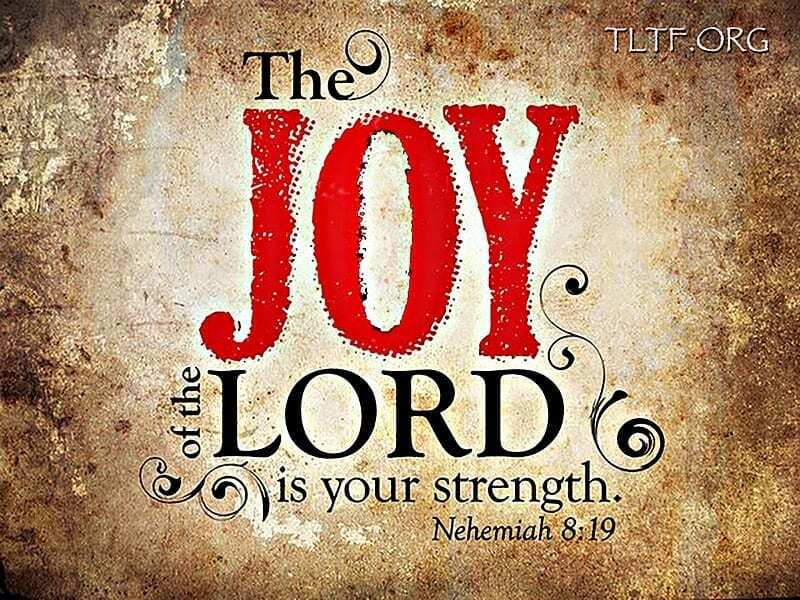 In fact, you will most likely have some misHAPS and therefore may not always be “HAPpy,” but manifesting THE JOY OF THE LORD is our choice, no matter the circumstances. When we launched The Living Truth Fellowship in early 2010, we very specifically chose the name that describes our overall goal: to LIVE God’s TRUTH, not just to know it. In God’s amazing grace and mercy, He has opened His Word to us in great depth, but, as per the following verses, we must ACT on it day by day in order to bring forth the fruit He desires in our lives. 21Therefore, get rid of all moral filth and the evil that is so prevalent and humbly accept the word planted in you, which can save you. 22Do not merely listen to the word, and so deceive yourselves. Do what it says. And what is the fruit that our Heavenly Father desires in our lives? Can you say “FRUIT of the SPIRIT”? Sure you can. Take a moment to focus on each of the following words in Galatians 5:22-23 and think of some of their biblical uses: love, joy, peace, patience, kindness, goodness, faithfulness, gentleness, and self-control. Then think about JESUS CHRIST, and how he perfectly epitomized each of these sterling qualities even though he was tempted in all ways as we are. What a Man! Now think about the fabulous truth that our Savior has equipped each of us with the potential to BE LIKE HIM, that is, to manifest each of the fruit of the spirit day by day, no matter the circumstances or the sinfulness of people with whom we deal. Finally, honestly take stock of the degree to which you currently exemplify each of these godly qualities, especially with those people closest to you. Believe me, I know—forthrightly evaluating yourself might hurt, but no pain, no gain. Our Adversary is very skilled at distracting us from the basic purpose of our existence, which is to know, love, and serve God and His Son. What else is there to do? NOTHING that does not somehow contribute to our becoming like Christ is worth our time and energy. But in this “amusing-ourselves-to-death” world, we can often shut out REALITY and live in relative oblivion to the “sin that dwells in us” (Rom. 7:18). This is especially true if we choose to isolate ourselves from other “sinners,” aka “Christians” plagued, like each of us is, with the carnal nature we inherited from the Chief Sinner, Adam. If most of our dealings with other people are superficial, it is much easier to avoid dealing with the nuances of how our own sin nature is deceiving us. It is when we choose to work closely with other saints to accomplish the ministry of reconciliation God has given us, and care enough about someone to get “down and dirty” with him/her—for their benefit—that we come face-to-face with sinful tendencies, both in their lives and, do not perish the thought, in our own. Somebody’s gotta do it, and in this vein, David comes to mind as one who stood out from the crowd in his bravery to stand up for God when all his Israelite brethren were afraid to do so. As a relatively young man, David took on the giant, Goliath, but first he had to endure the jealous jibes from his begrudging brothers. OK, I like alliterations. And shortly thereafter, standing alone on the plain and staring into the face of pure evil, he drew upon the power of God to permanently dispatch his, and God’s, enemy. Feel the faith in his bold words to Goliath. Scripture assesses David as, “a man after God’s own heart,” which is who I want to be. That summation of his life was not because he was sinless, for he obviously was not (think Bathsheba and Uriah, for example), but because at the bottom line of his heart, David’s innermost desire was to take up God’s cause and please the God he loved. That was evidenced by his zeal to repent when confronted with his sin. The world in which we live today is insane, i.e., unsound. Even a cursory, shuddering glance at REALITY shows how repulsive this “post-Christian” world really is. Hunger and starvation are widespread. The majority of people who are not mired in poverty eke out a living from hand-to-mouth with nothing in reserve. Crime is out of control. So is the opioid epidemic, as an untold number of humans try to numb the pain of their existence. God has been voted out of schools at all levels, and an accurate knowledge of His Word is a very rare commodity on the earth today, with most Christians being taught things directly contrary to what He says in His Word. In numerous categories of life, millions of people vehemently call light darkness and darkness light. When they need to take a break from rioting in the streets, many people don’t know which bathroom to use. Perhaps worst of all, HOPELESSNESS is rampant. Consider this from the Colson Center a couple weeks ago, in a piece titled, The So-Called Deaths of Despair: “For the third year in a row, according to a November report from the Centers for Disease Control, American life expectancy dropped. The last time this happened was a century ago, in the years 1915-1918, years marked by our entry into World War 1 and the outbreak of the “Spanish Flu” pandemic, which killed 675,000 Americans. This time, neither war nor pestilence is behind the drop in life expectancy. The threats are not external, but internal. The biggest factors behind the drop in life expectancy among Americans over the last three years are drug overdoses and suicides. In 2017, more than 70,000 Americans died from drug overdoses, and approximately 45,000 people intentionally took their own lives. Consider this: The state of the USA, and the world today, is much like the tumult of the 1960s, an infamous time in U.S. history when two Kennedys and M.L. King were assassinated, thousands of our young men were needlessly dying in the Viet Nam debacle, there was constant social unrest and rioting, drug use was widespread, and “free love” was costing some people their lives. I think about the popular cartoon back then that showed a hippie-looking guy holding a sign reading: “GOD IS DEAD,” and in the next frame a bush had grown from a seed to where it covered the word “DEAD.” “GOD IS!” Amen. You may not be old enough to have experienced life in the 1960s, but it was wild. And yet, what did God do? Amidst the chaos, He was far from idle. By way of “the Jesus movement,” He reached lots of folks and brought them to His Son. In fact, this writer and many of our readers were among those who came to Christ back then—and we were in the right place at the right time to learn the basic truths of God’s Word. But He and the Lord cannot do that without human cooperation. Ask your Lord Jesus what he has in mind in his personal curriculum for you in 2019. Then be like young David and take a firm stand for God’s truth and what is right, no matter the circumstances or the opposition. Launch out into the deep, let down your nets, and be a fisher of men. Take advantage of the opportunities (those kairos moments) you have to teach people the truth of God’s Word like they have never heard it before. You’ll be glad you did, both in this life and at the Judgment Seat of Christ. In closing, allow me to contradict an age-old adage: “The sky’s the limit.” No, the sky is NOT THE LIMIT, and maybe even before you finish reading this sentence, you’ll find that out firsthand as you blast off through the sky, the firmament, and the waters outside the firmament to meet the Lord Jesus in the “heaven of heavens.” As we walk—or sprint—into 2019, let us burn that glorious truth into our hearts. Our Lord is coming back for us!